My father was Nicholas (Nick) Zroback born 30 January 1914 in Kenora Ontario Canada. He joined the Canadian Army shortly after Canada declared war on Germany in the fall of 1939. Dad became a member of the Princess Patricia's Canadian Light Infantry and sailed to England in January of 1940. 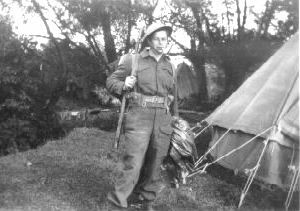 His regiment was part of the 1st Canadian Infantry Division which took part in the invasion of Sicily and then on to Italy. While in Italy he was promoted to the rank of Sergeant and was in charge of a platoon most of the time as Lieutenants didn't seem to last long, so dad said. When the Canadian Division was given the task of breaching the Savio River in Northern Italy, my dad's platoon managed to cross the flooded river under heavy opposition from small arms fire, mortars and those "potato masher" hand grenades. The platoon crossed the Savio River on 23 October 1944, and took approximately 250 prisoners which had to be escorted back across the river. Due to casualties and escorts for prisoners, the strength of the platoon was rather depleted. Dad sent his runner back to battalion headquarters to inform them of his predicament. The platoon was the only one from the regiment which made it across the river that night and was unable to defend itself from the German counter-attack and subsequently dad had to surrender. He called out using English but the attack continued. He called out again and this time in deperation using the Ukrainian language and the firing stopped. He later learned that the troops were Ukrainian nationals who chose to fight for Germany rather than for Stalin. Dad was immediately seperated from the five others who were left and he said he never saw them again. I recall dad telling me that when he was being relieved of his weapons and other equipment, an allied sniper shot one of the Germans in the near vicinity. He had good reason to believe that he was about to be shot but he was spared. I really did not get any more details of what happened except that he was interrogated, then placed in a cattle car on a train with other prisoners of war. The boxcar had straw on the floor, no drinking water and a couple of pails to be used as a latrine. He said that he had no idea where he was going but knew he was being transported across the mountains. The prisoners became very thirsty and in order to get some water, they would stick their fingers out throught the slats in the boxcar and get dew on their fingers then wipe their lips. He arrived at Stalag VII A and given the POW number 140488. He met up with South African prisoners who had been captured in North Africa and they were a great help in that they "knew the system", were able to trade with the guards and speak German. Dad told us stories of scrounging for food and wood. Told me of once boiling up a horse head which was full of magots. He fondly recalled the Red Cross parcels and taking turns opening them on a blanket so that the owner could get the crumbs. Dad also recalls the "potato wagon" which was behind the hospital full of potato peels from which soup was made. Once a loan allied fighter plane swooped down low over the camp and straffed the potato wagon. There was no more potatoes for soup for two weeks after that. Dad also recalled that his socks had worn out and he asked the "man of confidence" to take this matter up with the commandant so that he could get new socks. The answer came back as sort of a question; "do you remember those two squares of cloth you were issued when you arrived here? Well those were your socks". Dad thought that they were to be used to clean out his mess tins and that was what he used them for. My father told me of standing at attention for what seemed like hours at a time and the Alsation dogs would attack those who passed out. He was so impressed with the dogs who seemed to know how to count prisoners, that he bought one on his return to Canada. Dad recalled going into the de-lousing chambers and having his uniform steamed until it did not fit anymore. Once the metal buttons were removed from the uniform it was always difficult to keeps ones pants up. I really don't know how this next part fits in but I will tell it as my father told me. He said that the Americans were advancing close to Munich and the Germans wanted to move some of the prisoners and there was a lot of confusion at the time. He said that they were marching in columns and one of his buddies was sick and said that he could not keep this up for long. Dad, his friend and another POW a South African by the name of Desmond Butler dropped into a ditch until the column passed. They had made their escape but had to hide out in the woods stealing food and keeping out of sight. Dad and his friends were taken prisoner by American soldiers from General Patton's army and placed in Stalag VII A with the Germans. They insisted that they were also prisoners of war but had to stay as prisoners with the Germans until their names could to confirmed through Geneva. The Americans told my father that he could have taken the ID discs from a dead Canadian. He was not pleased with the treatment he received from the Americans but never held a grudge and only mentioned it to me once. Once the confirmation of identification was received, dad was taken to a hospital and finally returned home to Canada. Dad did not mention too much about his part in world war two but before he passed away he had to re-assure himself that he did the right thing at the Savio River Crossing. He attended the 75th anniversary of his regiment in Calgary Alberta and met his runner that he sent back and spoke with his old colonel and was re-assured that he had done the right thing. The colonel was going to recommend dad for the Distinguished Service Order (DSO) but because he was missing in action that sort of went by the boards. The Savio River Bridgehead is a battle honour on the regimental flag of the Princess Patricia's Canadian Light Infantry. Last update 22 Jan 2003 by © WebTeam Moosburg - All rights reserved!